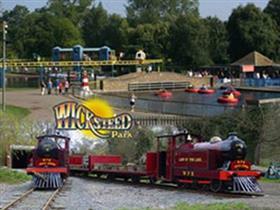 Wicksteed Park is a theme park in a lovely setting - 147 acres of landscaped Northamptonshire countryside. Wickestead is the only one of its kind in the UK to offer elements of country park and theme park in one. There are three distinct ride areas comprising in total 35 rides and attractions that are tried and tested traditional and modern family favourites. The fairground sited near to one of the largest free playgrounds in the UK and attracts younger visitors. It includes a traditional carousel, double pirate ship, jumping tower and unique 'Rockin tug'. Wheelchair users are free. Wicksteed Park is wheelchair friendly, and a small number of rides are accessible to wheelchair users. The Park grounds are open from Sunrise until Sunset throughout the year with the exception of Christmas Day. The Rides and attractions are open during Operational Season from 10.30am and will close between 4pm and 6pm depending on the time of year. If you require a closing time for the day of your visit, then please contact the park. During the Low Season Opening from 11am till 4pm, not all of the rides and attractions will be open.